Already known for their industry-leading products, Polycom’s latest release could be the best conference room phone to date. Seriously. It’s called the RealPresence Trio 8800. As a conferencing provider, we were pretty excited when we got our first one to play with. We actually had to stop our staff from opening it on their own until we could do a group unboxing event in the office! With unbelievable audio quality, a sleek design, and future-proof technology, the RealPresence Trio 8800 is a cutting-edge device in an ultra-modern package. Note: Although the Trio can come with an optional add-on for video conferencing, this review is on the Trio 8800 base unit only. Above anything, it’s imperative that any conference speakerphone has professional audio quality. While the Trio 8800 is full of features and looks incredible (more on that in a bit), it’s simply the best sounding conference phone we’ve ever heard. The audio alone makes it worth the investment. With it, Polycom managed to enhance their patented HD Voice technology to deliver an even richer audio experience than their previous phones. The Trio 8800 is also the only group audio conferencing solution in the world that contains a bass reflex port, which boosts the system’s efficiency at lower frequencies and preserves the ability to hear these lower sounds. A lot of people want a reliable speakerphone in their office, and one of the Trio 8800’s biggest features meets this need quite well. Playing a YouTube video on your laptop? Just bring it into your boardroom and connect it to one of the Trio’s two USB ports and the audio quickly switches to the Trio’s speaker. That’s right, you can use the Trio 8800 as the audio output for any device you wish to connect to it, whether it’s by Bluetooth, NFC, or USB cable. On a video conference call or listening to a webinar on your laptop and don’t want to use a headset? With the Trio 8800, you don’t have to. With a range of 20 feet (6 meters) out of the box and more with additional microphones, you can be sure you’ll be heard clearly on the other end of your conference calls. Polycom seems pretty aware that they nailed the audio quality on the RealPresence Trio 8800, calling it the “world’s clearest and richest audio experience powered by new, patented technology”. Like their other phones, Polycom’s patented NoiseBlock technology provides best-in-class noise cancellation that helps filter out any sounds that aren’t human voices too, from the crinkling of food wrappers to paper shuffling. While you might not buy or upgrade a conference phone based solely on its appearance, it doesn’t hurt that the Trio 8800 looks pretty slick. Without a doubt, it’s the most modern looking conference phone out there. Leading the way is its 5-inch color touchscreen that responds as fast as the latest smartphones. You can make calls, view logs, and sort through contacts all on the same easy-to-read screen. Rather than have volume control buried somewhere inside the touchscreen, the Trio 8800 has external volume buttons in the form of a plus and minus to minimize any mistakes. The rest of the phone has a matte black finish to limit fingerprints, too. Speaking of mistakes, no more accidentally hanging up on someone when you’re trying to mute them. Each leg of the Trio 8800 has its own LED-backlit mute button, so regardless of where you’re sitting in your boardroom, you won’t have to pick up or turn the phone just to hit mute. Under the hood of the RealPresence Trio 8800. The Trio 8800 is unbelievably easy to use, starting from when you take it out of the box. Setting it up takes only a couple of minutes. That’s it. 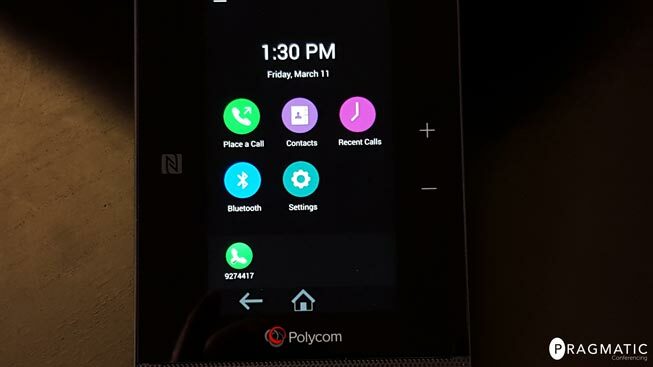 And if you’re already familiar with the interface for Polycom phones, you’ll be up and running even faster. Integration: The Trio 8800 supports native integration with Skype for Business and Microsoft Lync Server 2013, in addition to playing nice with Microsoft Exchange as well. For example, the Trio 8800 can be set up as a resource you can book or as a virtual attendee for joining or managing a conference. Multiple Logins: On top of an admin login, the user login limits functionality to device reboots and password changes only. 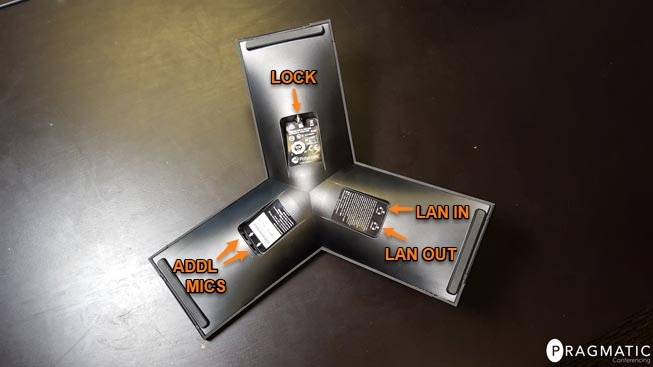 This prevents people from accessing and changing any of the phones settings or configurations, great for a larger team that has many different people using the conference room. NFC Pairing: Don’t have time to pair the Trio 8800 with your Bluetooth device? A quick tap on NFC area on the front of the phone lets you pair devices quickly and easily. With the Trio, you’re not getting just a conference room phone. With optional accessories, you can add content sharing and video conferencing capabilities. Perfect for huddle rooms. In the past, updating your conference phone’s firmware has been taxing. With USB ports on the Trio 8800, just download the update files onto a flash drive as they become available and plug it in. Simple enough! To download the latest Trio 8800 firmware and for a great walkthrough of how to install it, head on over to Jeff Schertz’s Blog. A phone system should have professional-sounding audio and a positive impact on your relationship with your customers. Changing or upgrading your phone system doesn’t have to be disruptive or expensive either. Polycom’s RealPresence Trio 8800 lets you accomplish all of these things, all with a modern appearance that’s been long overdue for conference phones.